Around the same time they were caving in to pressure to delete all Mohammed references from an episode of "South Park," the geniuses at Comedy Central posted an online video game containing truly staggering anti-Semitic images. This abomination was originally called "I.S.R.A.E.L. Attack!" due to the lead character being a murderous robot named "I.S.R.A.E.L." -- "Intelligent Smart Robot Animation Eraser." The character openly calls the robot by its acronym - ISRAEL - and the association created by those behind this game is unmistakable - Israel the child killer. The game is part of a promotional campaign for the DVD release of the now cancelled animated television series Drawn Together. The game opens with an evil looking, long-nosed character screaming at a faceless figure, "You lied to me, Jew producer". The blabbering, squirming, frightened "Jew producer" at first denies the accusation and then admits that he's "busted". And what did the "Jewish producer" fail to do? He did not kill each one of the Drawn Together cartoon characters after the show was taken off the air. So, to finish the job the "Jew producer" was supposed to carry out, the giant robot I.S.R.A.E.L - Intelligent Smart Robot Animation Eraser - is dispatched by the villainous mastermind to wipe out every character. Forever. The blue and white (the colours of the Israeli flag) murderous female robot, equipped with machine-gun, a rocket and eraser bombs goes on a rampage and destroys everything in its path, including animals and plants in addition to children. Interestingly, as the game loads a line on the right side of the screen informs us that the Drawn Together DVD was released on April 20. In case the date's significance has escaped you - April 20th is Hitler's birthday. Must be a coincidence. The unmistakable message is that when there's any slaughtering of children to be done, it's I.S.R.A.E.L that does the job. According to the creative team at Comedy Central, that's the natural association we should all make when we think of the Jewish state and its people. 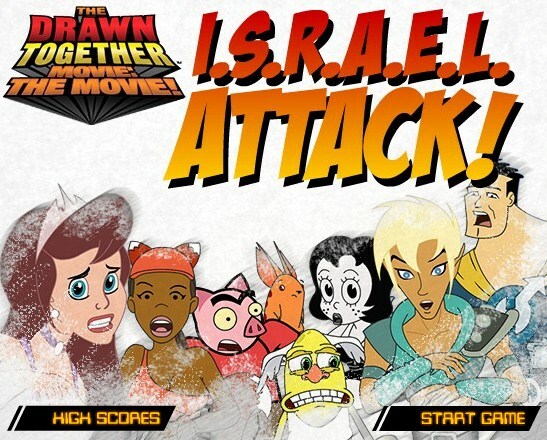 In a letter written to Comedy Central and obtained by the Forward, Abraham Foxman, head of the Anti-Defamation League, wrote: "We agree with complaints that this video game and other video clips and trailers featuring the ‘Jew Producer' character play into and encourage offensive anti-Semitic and anti-Israel stereotypes. While that may not have been the intent, the fact that your site caters to and potentially influences such a wide audience, including children and young adults, is especially troubling to us." The letter concludes by requesting that Comedy Central remove the game from its site, or alternatively put it behind a protective wall so that minors cannot access it. Comedy Central was evidently not insensitive to the negative publicity and the protests. The offensive introduction to the game was edited to remove the "Jew Producer" line. The title of the game itself was also changed to "Drawn Together: The Movie: The Game", making it far more difficult to locate on Comedy Central's website. The graphic featuring the original title "I.S.R.A.E.L. Attack!" is still there, however. The creators and executive producers of "Drawn Together," Dave Jeser and Matt Silverstein, describe themselves as "Jews" in their joint biography on Comedy Central's website. At the end of the bio they conclude with a self-written obituary: "In lieu of flowers, please send a donation to the Jewish National Fund (800-762-9273). Israel needs us now more than ever." Despite the religious affiliation of the executive producers, the folks at Comedy Central should certainly have known better.